Almost everyone in Maharashtra's Gadhchiroli district would know where Bangubais dawakhana is. The Maa Danteshwari Dawakhana in Dhanora (Gadhchiroli) is a landmark in this naxal-infested area, and Gangubai is none other than Dr. Rani Bang, a Padmashree awardee and Co-Founder, Search. Dr. Bang, a gynaecologist, along with her husband, Dr. Abhay Bang, a physician, has been providing healthcare to women and children for over three decades. The couple, alumni of John Hopkins University, gave up lucrative job offers from US hospitals to serve people in one of the poorest districts of India. "We were always clear that we wanted to be in the community development space and among the poorest of the poor." The Bang duo not only picked up health and social issues that impacted communities, they also did in-depth research, coming up with solutions that could be replicated in other rural communities. Besides, to bring about a change in the community, Bang realised she needed to belong there. Therefore, instead of fighting against traditional healthcare givers, she empowered them by getting them to adopt modern methods of medical care. One of Bangs earliest crusades was against malaria. "The villagers blindly believed traditional healthcare givers. When we talked to them, they admitted they were not able to treat malaria. So, we not only trained them to give immediate care, we also got them to explain to villagers that the breeding ground for malaria mosquitoes was stagnant dirty water and how important it was to keep surroundings clean." Population explosion is a big concern in India. As the government's primary focus is to control population, its national programme for maternal and child health tends to focus on family planning and not on health per se. According to Bang's study, over 90 per cent of women in rural areas have gynaecological issues and infant mortality is rampant. In Gadhchiroli itself, the infant mortality rate a decade ago was 120/1,000. "I told the authorities that we must focus on women and child reproductive health. This study not only changed the governments health policy but also had an impact all over the world. Nobody says maternal, the term used is reproductive health." And, to ensure that both woman and infant get the best possible care, Bang empowered traditional birth givers. 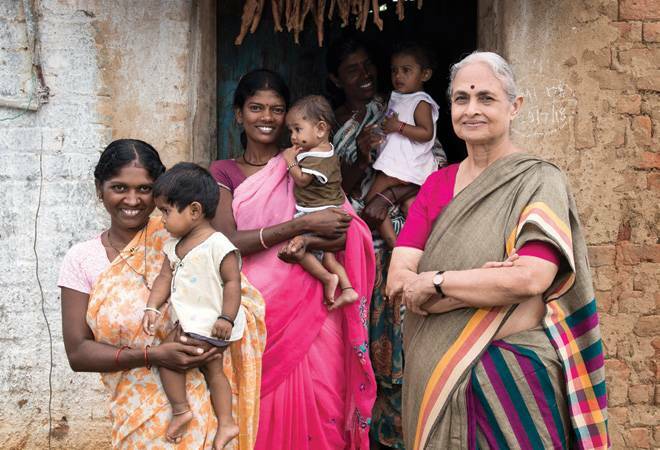 She learnt the methods of imparting non-formal education and trained as many as 125 birth givers. "We realised that 30 per cent of childrens deaths under five were because of pneumonia. Therefore, we trained traditional birth givers to diagnose and attend to pneumonia. Eighty five per cent of their diagnosis matched with that of trained paediatricians," she says. In fact, the infant mortaliy rate in that region is as low as 25/1,000 now, claims Bang. Her model of training traditional care givers has been replicated by governments of 17 emerging countries as well as by the Tata Trust in other parts of India. Bang's Search has also launched a programme, called Nirman, where it trains youngsters from all over Maharashtra to become change agents. Her vision is to see her model of community care being replicated across the country through the Nirman programme.